The Early Learning Council will be hosting a Community Forum. 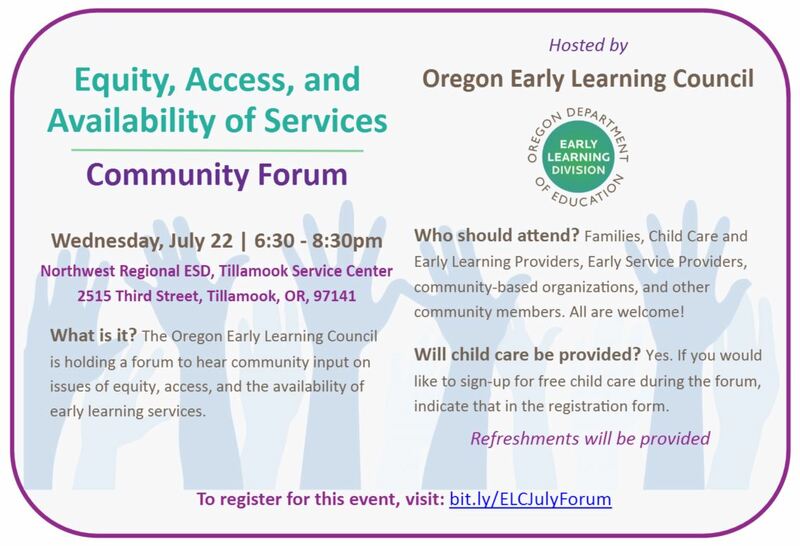 The Oregon Early Learning Council is holding a forum to hear community input on issues of equity, access, and the availability of early learning services. community members. All are welcome! Yes. If you would like to sign-up for free child care during the forum, indicate that in the registration form. Child care will be provided free of charge and an interpreter can be available if needed. Go to bit.ly/ELCJulyForum to register. Thank you! Download flyer. Usted está invitado al foro comunitario que es organizado por el comité del aprendizaje temprano (The Early Learning Council).